Así cuenta el Daily News de Nueva York su propia venta al grupo Tronc (Tribune Online Content, ex Tribune Publishing, ahora de Michael Ferro). The New York Daily News is sold to tronc, Inc. The New York Daily News, America's Pulitzer Prize-winning tabloid and the city's journalistic heart, has joined a leading national chain of flagship newspapers. Tronc adds The News to a stable of nine daily publications, including, the Los Angeles Times, Chicago Tribune and Baltimore Sun. Its corporate lineage traces to the Tribune Company, The News' longtime owner before Zuckerman. Buying The News thrusts tronc and its chairman, investor and internet entrepreneur Michael W. Ferro, to prominence in the nation's hyper-competitive media capital. He also gains a pugnacious populist voice that strives both to entertain with flair and to inform with deeply researched facts. The transaction shifts The News from ownership by a single, deep-pocketed patron to the organizational chart of a publicly traded corporation whose roster of newspapers is filled out by the Orlando Sentinel and Sun-Sentinel in Florida, the Morning Call in Allentown, Pa., the Daily Press in Newport News, Va., the Hartford Courant, and the San Diego Union-Tribune. 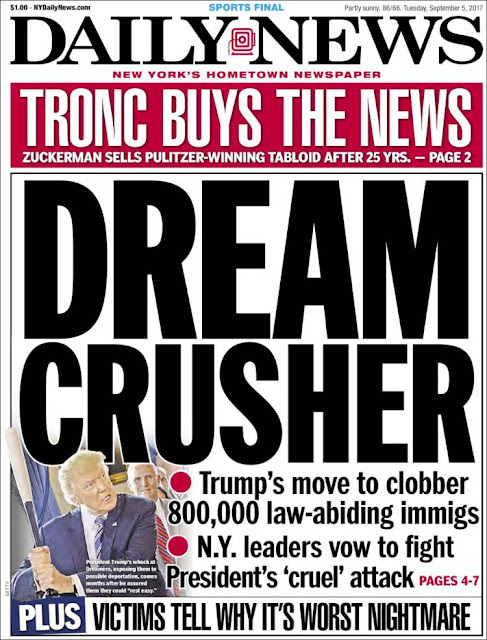 Boosted by the 24 million unique visitors drawn monthly to The News' online operation, nydailynews.com, tronc properties now count a total of 80 million such visitors monthly. "We are excited to welcome the New York Daily News team to the tronc family, and we look forward to working with them to serve new audiences and marketers while delivering value for our shareholders," tronc CEO Justin Dearborn said in a press release. "As part of the tronc portfolio, the New York Daily News will provide us with another strategic platform for growing our digital business, expanding our reach and broadening our services for advertisers and marketers." A billionaire real estate developer who had previously ventured into publishing, Zuckerman rescued The News from the rubble of bankruptcy in 1993. The paper's longtime owner, the Tribune Company, had provoked a near-fatal strike by trying to break its unions and then sold the weakened title to British press lord Robert Maxwell. Subsequently, Maxwell fell off a yacht and drowned – and was soon revealed to have been a swindler. Spanning almost a quarter century, Zuckerman's tenure encompassed fully 25% of the News' 98-year existence, generated five Pulitzer Prizes – almost half of the paper's total of 11 – and propelled the organization into the digital age. "Over the past near-century, the Daily News has served New York City and its surrounding areas with its award-winning journalism and helped shape the dynamics of the city," Zuckerman said. Former Co-Publisher Eric Gertler, who spearheaded the transaction for The News, lauded New York’s Hometown Newspaper as a city staple with a bright future. “The Daily News is a venerable New York City institution,” Gertler said. "We believe that under tronc's leadership, the Daily News will maintain its tradition of excellence in journalism and continue to be a critical voice for millions of print and online readers." A native of Merrick, L.I., Ferro came of age in the Chicago area. After a fast-moving career that featured founding or taking interest in several tech-related companies, launching a private equity firm, and participating in a failed bid to buy the Chicago Cubs, he entered the media world in 2011 by leading a rescue-takeover of the Chicago Sun-Times, a paper that has since secured new ownership. In 2016, Ferro's investment firm took a controlling interest in Tribune Publishing, a spinoff of the protracted bankruptcy of The News' original owner, the Tribune Company whose assets included a portfolio of newspapers. Tribune Publishing was rebranded as "tronc" a name meant to signify Tribune Online Content. Citing a "pixels to Pulitzers" strategy, the company website describes tronc as "a media company rooted in award-winning journalism, which harnesses propriety technology to present personalized, premium content to a global audience in real time." With the addition of the News' 11 Pulitzers, tronc gains bragging rights to 105 such honors. "Instead of playing golf and doing stuff, this is my project: journalism," Ferro told the Chicago Tribune in March 2016. "We all want to do something great in life. Just because you made money, is that what your kids are going to remember you for? Journalism is important to save right now."